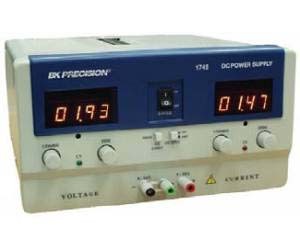 B+K Precision model 1745 is a 0 to 35V, 0 to 10A DC Power Supply. This power supply has all of the great features you would expect B+K Precision power supplies to have and some new features not normally seen on power supplies in this price range, these features include an output On/Off button and an output shorting button. The On/Off button allows the user to turn off power to the output terminals without powering down the power supply. The output-shorting button allows the user to short the output terminals to set the current limit.